The Iron Giant is the story of a boy and his giant robot. Sure we've seen variations of the boy and his _____ since the beginning of film but this one truly stands out. The film also has more on its mind than the boy hiding his giant friend from his mother. The story is set in 1957 at the height of the cold war. When the robot crashes into the ocean Americans are staring at the night sky fearfully anticipating an attack from Sputnik. The opening scenes perfectly set up the overall theme of the film. We always have a choice on who we are and what we fear. Even a weapon can choose to be a friend. As heavy handed as this might sound I assure you its not. The story strikes a perfect balance between humor and heart. The film is always interesting and insanely re-watchable. I've seen the films at least five times and the ending always gets to me. If this film were released today I have a feeling it would find its audience and would be recognized for the wonderful film it is. 15 years ago the world of animation was completely different, Pixar hadn't taken over and you didn't see an animated film without musical numbers. Its no wonder this wasn't a financial success, there wasn't anything else like it at the time. I'm sure the studio knew they had something great on their hands they just didn't have a road map of how to proceed. After seeing The Iron Giant its no wonder Pixar tapped Brad Bird to make The Incredibles. 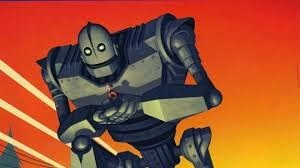 Even though The Iron Giant is traditional hand drawn animation it feels like a Pixar film and I mean that as an absolute complimnet. Pixar has become synonymous with quality. While I can and do appreciate how far the quality of CG animation has come I miss the hand drawn stuff. I understand that old style animation is too cost prohibitive for most films but I would love to see a Pixar film hand drawn. The goal of CG animation seems to be photo realism and the closer you get to reality in cartoons the further you get away from the charm and warmth of something created by hand. This is one of many opinions I hold that makes me sound older than I actually am. If you haven't seen this film I can highly recommend it. This is a great film, one that everyone should see. If you have kids, great they can watch it with you. If you don't have kids, don't worry this is not a film written for children. You will never feel above the film. If you have any warmth in your heart this film will connect with you. Yes I am saying if you don't like this film, you are cold. You are a cold heartless individual that I feel sorry for.